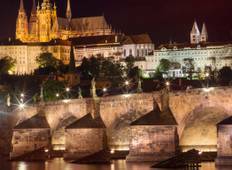 Find a culture trip that explores Central Europe. There are 168 cultural tours to choose from, that range in length from 3 days up to 28 days. The most popular month for these tours is September, which has the most tour departures. "I didn't really know where I wanted to travel. I told the online agent that I was..."
"Loved my tour! Everything was great"
"This tour had everything I was looking for! Great Eastern European food, great local..."
"Kassie was an excellent guide and Drajan the driver was very experienced. Accommodation..."
"Greg is an amazing tour director. He had constant energy, did an incredible job meeting..."
"The trip was so great it's too bad we didn't get more time in some places. The sun..."
"This was a fabulous trip which was very well paced, it covered parts of Croatia that..."
"enjoyed the tripped. would have liked ore photo stops in the countryside. I am interested..."
"Sailing in Croatia is just a magical experience and On The Go Tours made it easy...."
"Fantastic tour! We spend the week with our guide Cristi Harbuz. He is very knowledgeable..."
"This was a great taste of central Europe. Our guide was excellent. She helped us..."
"I though the Intrepid tour was fantastic. The group leader did a great job in looking..."
"Kassie was an absolute pleasure! Always a positive attitude and accommodating to..."
"It was awesome, the travel guide knowledge was fantastic. He was an Aussie living..."
"The tour overall was ok. I had fun and visited most of the places I had in mind in..."